Here is the long-awaited odyssey that forged the character and tempered the spirit of Dan’s mentor. 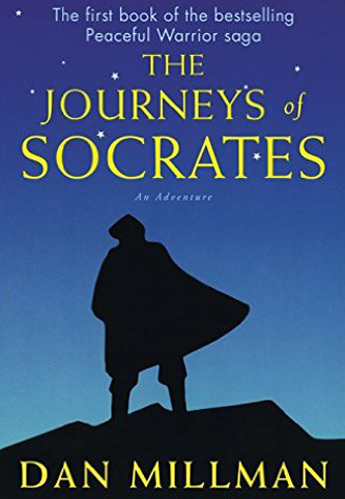 A spellbinding story of courage, faith, and love, The Journeys of Socrates reveals how a man became a warrior . . . and how a warrior found peace. In Tsarist Russia, an orphaned child born of Jewish and Cossack blood grows up in a land of growing discontent. At an elite military academy, young Sergei Ivanov (Socrates) comes of age training to protect a way of life he doesn’t understand. When a sudden death forces Sergei to flee, he escapes into the wilderness, with nothing to cling to but the memory of his grandfather and the promise of a gift buried near St. Petersburg. What follows is a story of love and loss, of hardship and triumph as Sergei encounters mentors, masters, and a mortal enemy. Searching for a child he has never met, Sergei’s odyssey unlocks hidden wisdom at the heart of life. I read Dan’s previous Warrior books, but THIS one was his finest. Riveting . . . enlightening …unbelievable. My friends are fighting over who gets my copy next … his writing is just superb and has only gotten better with age. Judith O.
I’ve been reading your work ever since a friend of mine loaned me “Way of the Peaceful Warrior” in 1992. I just finished The Journeys of Socrates . . . your writing is warm, thoughtful and best of all, it makes me stop and think about where I am and where I want to be in this life. May God bless you and your work. I am a part-time book selller for a small Waldenbooks in Vermont and this is my first contact with your work. I was fortunate to receive an advanced reader’s copy of your new book. I read it in two days. It is a marvelous work and I will recommend it often. As all good books do, it made me laugh sometimes, it made me cry sometimes, and it made me think, a lot. Brian S.
I believe The Journeys of Socrates is your best work to date . . . it has motivated me in many ways . . . I felt like an altered state as I read . . . you took me to where the characters were, I mean — really took me there — the sights, the sounds, the emotions, the smells, the scenery — a sharing different from any I have experienced before. And I learned so much. Thank you, from my heart, for bringing me such a well of emotions, comfort, hope, peace, and pure enjoyment of adventuring with Sergei/Socrates and all the other characters. I hope they make this story into a movie. I’ll be first in line! Trisha B. It is so different from any of your other works but despite being a novel the lessons of life are still there for us stalwarts. Congratulations you have surpassed yourself. I now know why you went off to Russia for martial arts training . . .
I’ve just been totally bowled over by The Journeys of Socrates, and have told all my friends. I laughed and cried and was horror-struck, and totally drawn into the story. I can’t quite articulate how it has touched me . . . it really has had a profound effect on me . . . and the style of writing is beautiful. Last night I looked into the turquoise sky at sunset and said a quiet thank you to Sergei Ivanov . . .
From the moment I started reading I was intoxicated by the story . . . I loved experiencing the whole process of how Socrates came to realizations, and I felt like I was enlightened in the process as well. The book gave me insight into what is important in my life, and also the the way to make peace in our world today. Even if one is unaware of the WPW series, it would be a great read. My wife works for Borders books and received an advanced copy of your new book. I read it in 2 days. I just could not put it down. I am a martial arts instructor and already praising it to all my students and friends. I will be giving it as birthday and Christmas presents this year.